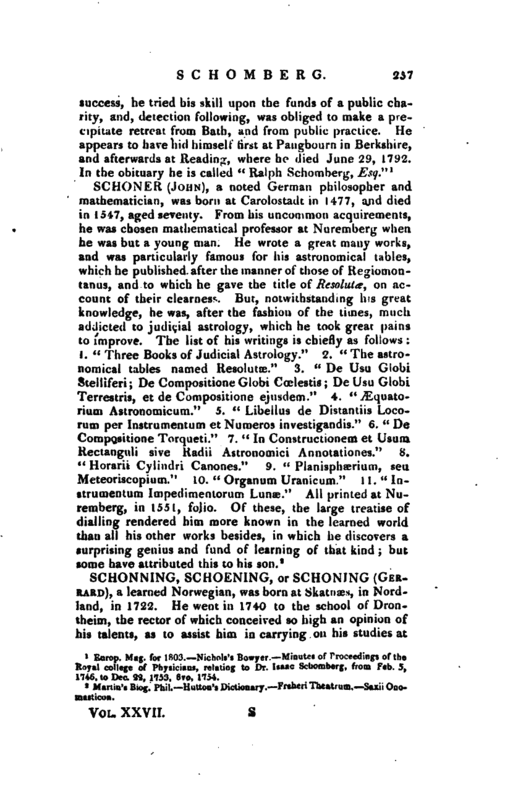 , one of a family of physicians of some note in their day, was the son of Dr. Meyer Schomberg, a native of Cologne, a Jew, and, as it was said, librarian to some person of distinction abroad, which occupation he left, and came and settled in London, where he professed himself to be a physician; and, by art and address, obtained a lucrative situation amidst the faculty. In 1740 he had outstripped all the city physicians, and was in the annual receipt of four thousand pounds. He died March 4, 1761. This, his son, was born abroad, and at the age of two or three years was brought to England, where he received a liberal education, and afterwards studied at Leyden. After his return to London he set up in practice, but had a dispute with the college of physicians, as, we are told, his father had before him. The particulars of this dispute are not uninteresting in the history of the college. 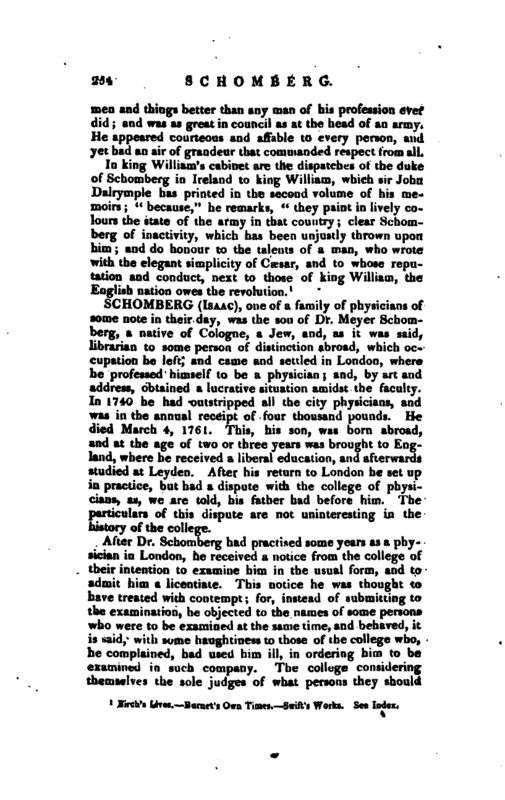 After Dr. Schomberg had practised some years as a physician in London, he received a notice from the college of their intention to examine him in the usual form, and to admit him a licentiate. This notice he was thought to have treated with contempt; for, instead of submitting tothe examination, he objected to the names of some persons vyho were to be examined at the same time, and behaved, it is said, with some haughtiness to those of the college who, he complained, had used him ill, in ordering him to be examined in such company. 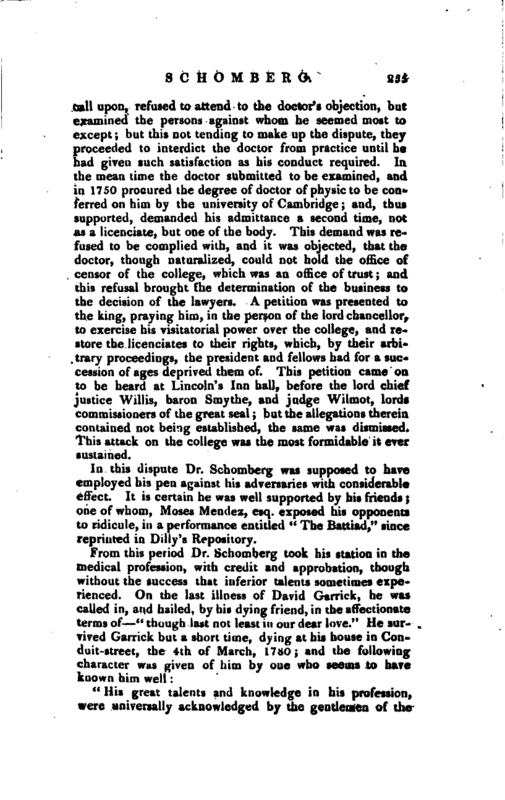 The college considering themselves the sole judges of what persons they should | upon, refused to attend to the doctor’s objection, but examined the persons against whom he seemed most to except; but this not tending to make up the dispute, they proceeded to interdict the doctor from practice until he had given such satisfaction as his conduct required. In the mean time the doctor submitted to be examined, and in 1750 procured the degree of doctor of physic to be conferred on him by the university of Cambridge; and, thus supported, demanded his admittance a second time, not as a licenciate, but one of the body. This demand was refused to be complied with, and it was objected, that the doctor, though naturalized, could not hold the office of censor of the college, which was an office of trust; and this refusal brought the determination of the business to the decision of the lawyers. A petition was presented to the king, praying him, in the person of the lord chancellor, to exercise his visitatorial power over the college, and restore the licenciates to their rights, which, by their arbitrary proceedings, the president and fellows had for a succession of ages deprived them of. This petition came on to be heard at Lincoln’s Inn hall, before the lord chief justice Willis, baron Smythe, and judge Wilmot, lords commissioners of the great seal; but the allegations therein contained not being established, the same was dismissed. This attack on the college was the most formidable it erer sustained. 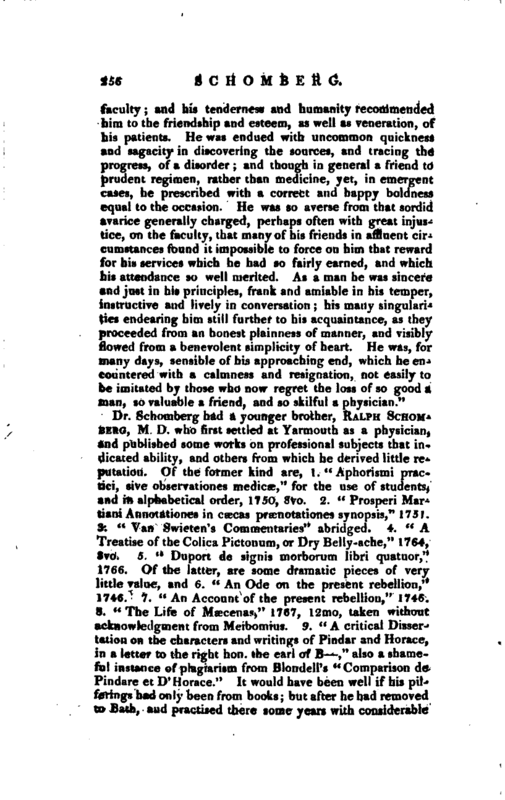 In this dispute Dr. Schomberg was supposed to have Employed his pen against his adversaries with considerable effect. It is certain he was well supported by his friends; One of whom, Moses Mendez, esq. exposed his opponents to ridicule, in a performance entitled “The Battiad,” since Reprinted in Billy’s Repository. Europ. Mag. for 1803.—Nichols’s Bowyer.—Minutes of Proceedings of the Royal college of Physicians, relating to Dr. Isaac Schomberg, from Feb. 5, 1746, to Dec. 22, 1753, 8vo, 1754.